Air From Kanye West Show Selling For $60,000 On eBay. Here’s some news that will make you NOT want to live on this planet anymore. 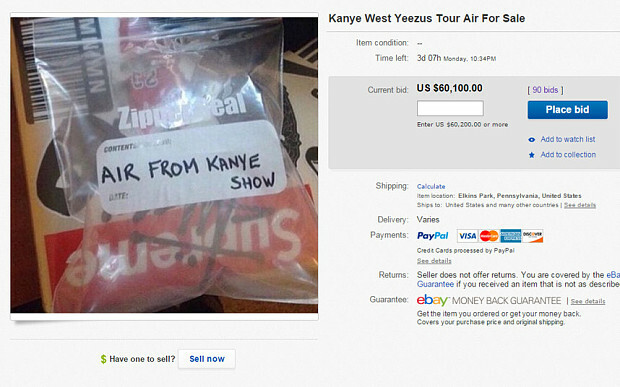 A bag of air taken from Kanye’s tour has attracted more than 90 bids on eBay which still has 2 days left of the sale. The bag was listed with a starting price of $5 on Sunday, and is now in the middle of a bidding war between a handful of users. However, he has supplied no evidence to show which concert he was in attendance at. The lucky buyer will receive a zipped back with the words “air from Kanye show” written on it. If Kanye’s “air” doesn’t have you logging onto eBay, rushing to put in your bid, you might want to consider something else of Kanye’s that is on sale. 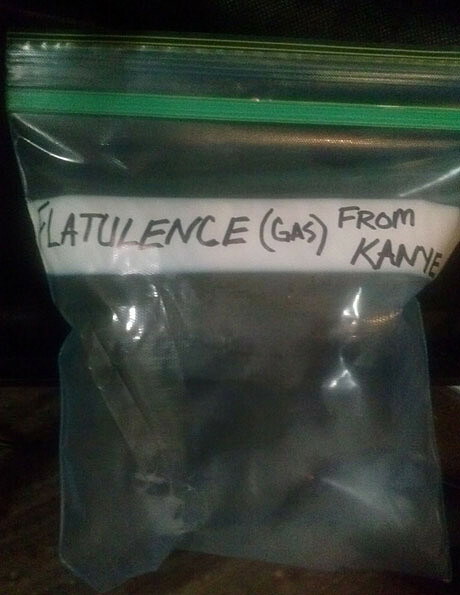 You can purchase a bagged “fart” from Kanye West, which has a reasonable starting price of only $5.